The beginning of Fall marks the beginning of my busy season. Fall is my favorite season, but I typically don't enjoy it as much as I should because I spend most of it stressed out and overwhelmed. Besides the holidays, this is our birthday and anniversary season. We have a celebration of one kind or another almost every week from now until the end of December. I don't know why our family decided to do all of its birthing and marrying in the Fall, but that's the way it worked out. 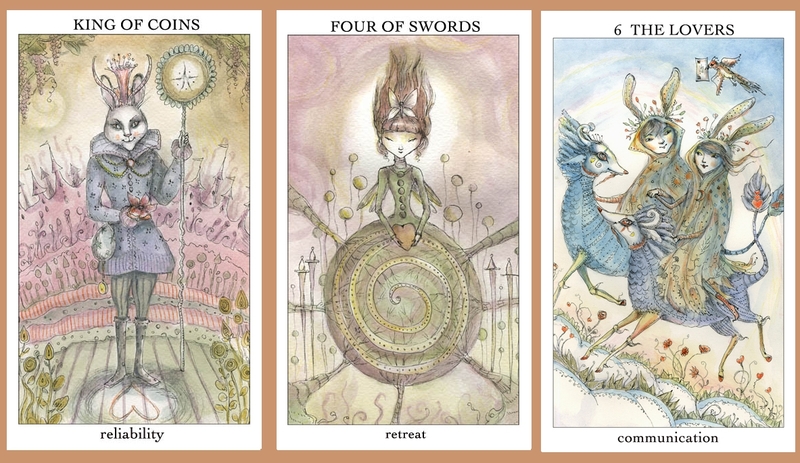 I was reading a guest post by Brigit Esselmont at Tarotize.com about how a beginner could learn to read the Tarot in just five minutes by using the images on the cards to tell a story. I decided to give it a try, asking the question, "What's the best way to approach this holiday season to avoid becoming overwhelmed?" There's a man, well, a bunny, a bunny man! There's a bunny man offering a modest but beautiful gift. At his feet is a heart, symbolizing love. He stands in front of his beautiful kingdom looking peaceful and content. I should remember that the celebrations, gifts, and gatherings are there for the purpose of loving each other. The gifts don't have to be expensive. That's not what's important. Opening up my home to our extended family and friends for the celebrations is one way I can show them how much they mean to me, and that is the best gift of all. In the next card is a woman who appears to be meditating. She is centering herself, and in her hands she holds another heart, another symbol of love. She is surrounded by, what looks to me like, balloons. Is she closing her eyes and catching her breath in the middle of a party? When I start to feel overwhelmed, I should step back and take some time to center myself. During the parties, instead of worrying whether or not everything is perfect and whether or not everyone is having a good time, I can sit and let myself soak in the love of my family gathered together. I can take a time out, even in the middle of a social event, to just be present. The last card shows two people holding hands while traveling together somewhere. They are followed by a winged messenger, symbolizing communication. Where are they traveling? Maybe they are going Christmas shopping at the mall! Maybe the message here is that I don't have to make all the preparations and gifts by myself. I do have a partner to help me, but I have to communicate with him and let him know when I need help. Typically, I do handle all of the holiday preparations by myself. I buy the gifts, bake the cookies and cakes, make the meals and all the plans. My husband is always willing to do whatever I need him to do to help, but if I don't ask, he doesn't know what I need. Perfection is not the goal this holiday season. Loving each other, and taking the opportunities given by the birthdays and holidays to spend time together is the goal. I will take time out from the preparations and celebrations to breathe and be present, and I will rely more on the support my husband can offer by communicating with him so he knows what I need from him. Sorry about all the chaos! To be honest, the holidays make me tense, too. I think that's why I see so many articles on the internet about how to make them less stressful. My daughter and two little sisters have birthdays in December--then Christmas and oh, I hate traveling! But the past few years we can't afford to travel at all so that has actually helped the stress level. For gifts we no longer give Christmas gifts. We do stockings sometimes, or one or two smaller gifts for our daughter. Birthdays...I wish I had unlimited money because I so love buying and giving gifts. :) I think DIY projects have been a saving grace, which is why I've considered doing DIY stuff as part of my on-line business plan. My husband's 40th birthday is coming up and I have to decide what the best thing to do would be, financially. Either way I just hope we can relax and have a good time. Those are good ideas. I tend to let my perfectionism spoil things for me, and I always think (no matter what gift I give) that it's not good enough. TOTALLY defeats what the holidays and birthday celebrations are all about. I was actually AMUSED that my sisters loved the laundry detergent so much that they requested it numerous times. I was like, 'Are you SERIOUS?!!! It is SO easy to make.' But they thought it was the coolest thing ever.